“Art Matters” on TVCogeco, hosted by Andrew Nicholson and Deb Tymstra and produced by David Bartlett, interviewed Robert Tang & Beverley Cayton-Tang from danceScape. 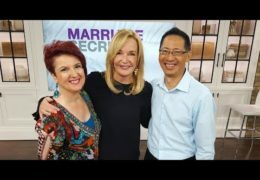 Robert and Beverley are 3-time Canadian and 2-time North American Ballroom Champions, as seen on CBC Television’s “Dragons’ Den” and “Fortune Hungers”, Oprah WInfrey Network’s “Healthy Gourmet” and ParticipACTION’s “Get Inspired. Get Moving.” television campaign. In case you missed it we take a look at Monday nights “Dancing with the Stars”. Medford’s Maria Menounos faltered in her foxtrot on Dancing with the Stars, but she came out OK in the voting. Green Bay Packers wide receiver Donald Driver’s kids talk about their Dad on “Dancing with the Stars”. New “Dancing With The Stars” season has unreal lineup…do you agree? There is some amazing talent on season 14 of “Dancing with the Stars”…do you agree? We’ve already shown you the dancing highlights from Monday night’s “Dancing With The Stars”…Host Tom Bergeron stopped in to talk up the new season. Welsh popera singer Katherine Jenkins, American actor Jaleel White and Cuban-American telenovela superstar William Levy top the competition on the first night of “Dancing With the Stars”. OREM, Utah (ABC 4 News) – Grab your dancing shoes and your favorite floor partner. The season premiere of “Dancing with the Stars” airs Monday night. If you watch the show, you probably know it has a long history with dancers here in Utah. ABC 4’s is looking at who may be next in line.